The Fitzwilliam Museum in Cambridge has a fascinating exhibition on at the moment called “Treasure Under Your Feet” which runs until 4th September 2011 in the Octagon Gallery. The exhibition consists of displays of various discovered treasure from the East Anglia region which have helped archeologists understand the life and times of our ancestors. These precious objects not only look beautiful but they are a physical and emotional link back to the people who used them hundreds of years ago. 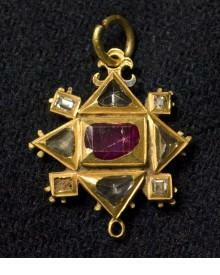 Exhibits in the “Treasure Under Your Feet” exhibition are from local public and private collections – such as the above jewel from Colchester Castle Musuem – in addition to pieces from the Fitzwilliam Museum itself. Notable items from the exhibition include a Bronze-Age torc which was a piece of jewellery worn around the neck, a Tudor jewel, hack-silver used by the Vikings as currency and gold coins from the English Civil War which date back to the 17th century. The Fitzwilliam Museum was described as “one of the greatest art collection of the nation” by the Standing Commission on Museums & Galleries in 1968. It houses an extensive world-class collection of art and antiquities covering hundreds of years of history from ancient civilisations to the present day. Highlights of the Fitzwilliam Museum include an extensive collection of British and European paintings from the 14th century to 20th century, sculpture, furniture, armour, European and Japanese porcelain, illuminated manuscripts, and antiquities from Egypt, Greece, Rome and other ancient civilisations from the Mediterranean and Near East. After working up an appetite wandering around the museum, you can stop off for a drink and bite to eat at the Courtyard Café which serves sandwiches and light lunches together with morning and afternoon refreshments. The North Lawn Café is now open until October and serves al fresco refreshments for visitors who want to enjoy the open air when the days are warm and sunny. Admission to the Fitzwilliam Museum is free but we recommend that you make a small donation which will pay for the maintenance of the galleries. The museum is closed on Mondays but is open between 10am and 5pm Tuesday to Saturday. On Sundays and Bank Holiday Mondays it is open between 12pm and 5pm. Tagged art, cambridge, exhibition, museum. Bookmark the permalink.